Thousands upon thousands of Allied and German casualties occurred on the beachhead of Anzio during World War II. Thankfully my uncle survived. Sadly organizers of the 2009 World Baseball Cup, to be held in Nettuno, Italy from 22-27 September 2009, have stepped over a line. They have released a promotional video for the event, simulating a baseball "invasion" of Anzio. 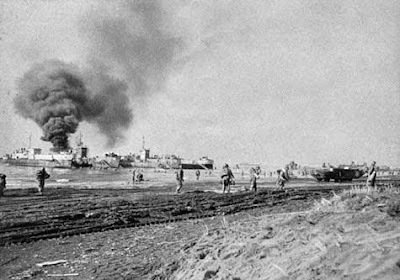 Invasion Force: Allied forced landing in Anzio in 1944. Ken Fang of Fang's Bites is quite correct that the promo is eye-catching. He also notes that it was filmed at Anzio, home to the "largest American military cemetery in Europe." If belittling the efforts and lives given by both sides in that battle was not bad enough, the tag line is even worse: "The battlefield is back in Nettuno." So watch this video for yourself, and think about your reaction to it. A poll follows the video.